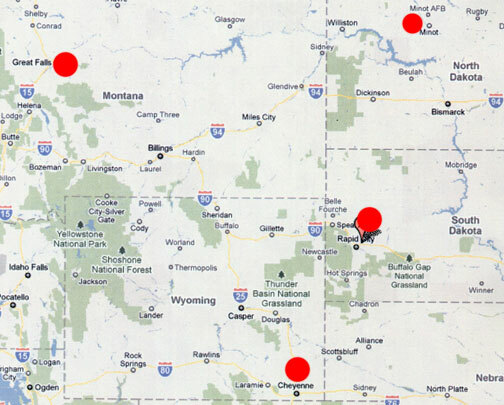 Malmstrom AFB near Great Falls, Montana (upper left circle); Minot AFB near Minot, North Dakota (upper right circle); Ellsworth AFB near Rapid City, South Dakota (middle right circle); and Warren AFB near Cheyenne, Wyoming (lowest red circle). November 8, 2010 Albuquerque, New Mexico - Since posting my October 25, 2010, interview with retired USAF Captain Robert Salas [ 102510 Earthfiles ] about his firsthand experience 60 feet underground in a Minuteman missile silo at Malmstrom AFB on March 24, 1967, I have received several emails about other similar incidents. Below are some of the most substantive for Earthfiles viewer consideration. I welcome further feedback and will always honor requests for confidentiality. Previous PostPrevious Part 4: February 1971 – Blond Beings Created and Control Grey Androids?